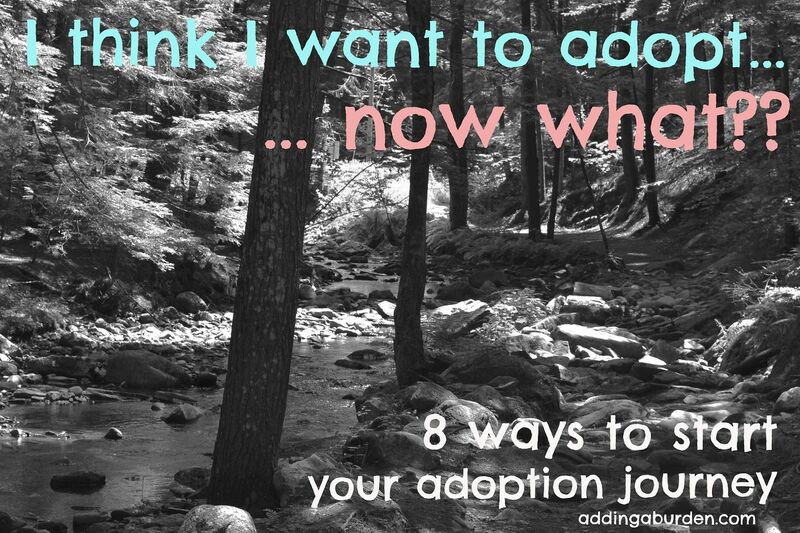 Adding a Burden: I think I want to adopt… now what? Eight places to start exploring. I think I want to adopt… now what? Eight places to start exploring. A few times each month I receive a message from a reader who asks something like, "We think we want to adopt, but we have no idea where to start. Help!" 1. Attend a local adoption seminar. Although we did not end up using them for our adoption, John and I started our adoption journey by attending two seminars by Bethany Christian Services. I can't say enough good things about these seminars! The first we attended was on the topic of financing adoption and the second was specific to international adoption. Bethany is not the only agency that puts on these seminars; a quick google should make you aware of agencies in your area and a follow up email or visit to their website will help you find an info meeting in your area. Check it out! 2. Listen/watch webinars and podcasts. These web-based info meetings might even be preferable for some of us as you can attend from the privacy of your own home without worries about running into someone you know before you are ready to announce your adoption plans or finding a babysitter for any kids at home. I checked out a few different webinars specific to embryo adoption this time around and learned a ton! Additionally, this way you can learn about adoption related issues like attachment, adopting kids with special needs, or how to form a relationship with birth parents. Don't overlook these valuable opportunities to learn about adoption! 3. Talk to people! There is nothing better than talking to someone who has been down the adoption path before you. If you know someone who has adopted, sit down with them and hear their story. Ask questions. Get a personal perspective. If you don't know anyone, ask your friends if *they* know anyone. I know I am happy to share our journey with anyone who asks! You can even ask a local agency if they can put you in touch with a family who has been down the same path you are considering. You will also want to get in touch with a few different agencies to hear about how they operate and learn about different types of adoption. Before we decided on embryo adoption, John and I strongly considered foster-to-adopt and were impressed when a social worker from a local foster agency offered to come to our home to talk to us about fostering/adopting. We learned so much from his visit and it really helped us discern our path forward. 4. Check out the Next Steps Booklet from the Christian Alliance for Orphans. This booklet is available online and provides a list of reputable adoption agencies (among other things). If you feel lost as to where you could even start looking for an agency this is a great resource! 5. Visit the US Department of State Inter-country Adoption Website. (http://adoption.state.gov) I found this website very helpful in our beginning stages. If you are considering international adoption this site will provide a great overview of different countries and their adoption program requirements and processes. 6. Look through Resolve's resources on adoption. Resolve is an National Infertility Association and they have a great list of resources on their site for prospective adoptive parents. I especially like their "Questions to Ask" page which will help you ask good questions when deciding on an agency. 7. Learn about how different agencies operate in order to choose one that's right for you. This article from Adoptive Families is a great place to start. Different people will have different fee structures, levels of parental (and birth parent) support both pre and post adoption, and timelines (while no agency should give you a "definite timeline" they should be able to estimate your home study timeline) among other things. Your agency should employ licensed social workers and be accredited through a larger governing body like the Joint Council on International Children's Services. For most international adoptions your agency should be Hague Accredited. 8. Join adoptive parent groups. Whether you find an adoptive parent group in person or online, these groups will be a great resource for every step of your journey from agency recommendations to advice after your child has come home. I belong to a few different groups via Facebook and also in person groups which I've found through local churches in our area. Groups can be general ("adoptive parents") or specific (to your type of adoption, country or origin and even special need if your child has one). Some Facebook groups will be private, but I found once we made our adoption plans known I was quickly connected to them through friends and through our agency. Don't miss out on this terrific resource! Decide to adopt > decide on domestic/international/foster care > decide on agency > never look back! Think you might want to adopt > feel overwhelmed > research all different kinds of adoptions > feel MORE overwhelmed > decide on international adoption > decide on country > change your mind > decide on another country > research an agency > something doesn't feel right > switch to domestic adoption > find another agency> second guess yourself > recommit to your path > move forward > wait a lot > bring your child home > tell everyone it he/she was worth it all! It's totally normal to feel a bit lost in the process. You'll get there! Keep asking questions, researching, and moving forward one step at a time. Be patient with yourself and your partner and trust that the right path will make itself clear as you research and pray for discernment. What other recommendations would you add for people exploring adoption? I'm not sure what the equivalent is in the USA, but in Canada, you can adopt through CAS or Children's Aid Society. It's essentially child protective services. And I realize people don't want to discuss cost but, in this case, there are no fees associated with adopting a child. If my husband and I decide to adopt down the road, this is the route we'd take. In the US that's like adopting through Foster Care. An excellent option! From my research with various agencies in Michigan though, you have to be adopting an older child or- if you are hoping to adopt a younger child- open to doing foster care where adoption may or may not be a possibility. It's a different mind-set than straight adoption via domestic or international routes. I adopted both my kids from VT social sevices -- even though I am Canadian + my family lives in, well, Canada. The kidlets are so so so loved but it is a travesty that no US family was willing to adopt either one -- beautiful, smart, healthy newborn boys -- because they're African American. Yet there are zillions of US families on long, long waiting lists to adopt very-likely-trafficked kids from Ethiopia, DRC, Uganda, etc (who are, well, pretty much guaranteed to be kids of color). Wow I've never heard of a Canadian adopting from the US! Are you married to an American? Trafficking is a real issue and not to be taken lightly, but we should also be aware that many of these long waiting lists aren't because there are too many adoptive families and "not enough" kids, but because of bureaucracy holding up the process, creating a bottle neck. ALL CHILDREN need families, regardless of where they are from or what they look like. I'm 23 and I want to adopted just not sure I'm ready..